Taglines: In the game of life, you can't lose 'em all. Errors in geography: When the team is on the bus heading to a match, they are going from their school in NJ to another school in NJ. However, the shot of the road they are driving down is in Rockville Centre, Long Island, NY (one of the admitted locations where the movie was filmed). In traveling from one school in NJ to another school in NJ, there would be absolutely no reason to pass through LI. Jackie Flaherty: I wanna go to Ohio and beat the crap out of his mom. Mike Flaherty: Oh, come on. Jackie Flaherty: No, I do. I want to beat the crap out of her and her stupid boyfriend. Mike Flaherty: I know you are. I just-I just don't think beating the crap out of everybody is the best solution, that's all. Jackie Flaherty: It feels like it. 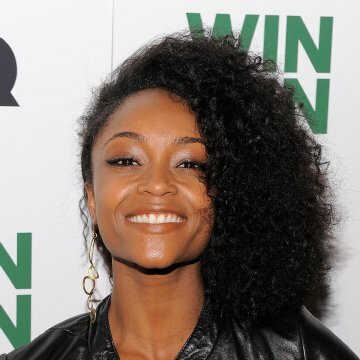 Win Win is a terrific multigenre sleeper. It's funny, even hilarious; it has mystery and action; and it features brilliant performances by the always-reliable Paul Giamatti and Amy Ryan. It's also not a movie that wallows in treacly messages, and it's not a movie that uses sports as a crutch for "finding one's inner strength." In short, it's a wonderful, top-notch movie. Giamatti plays Mike Flaherty, a small-time lawyer who's running low on cash. He moonlights as coach of the local high-school team, which is, to put it bluntly, terrible. In a burst of fiscal sanity, Mike offers to become legal guardian for Leo, one of his clients (played by the crusty Burt Young), who's just been declared legally incapacitated. Why? Because as his guardian, Mike gets $1500 a month. But since he wants to avoid the extra hassle of actually taking care of Leo, he puts him in a nice home. Seriously, it's a nice home, with nice people and a big flat-screen TV. At this point, the movie wants us on Mike's side  sort of. He needs the cash, and he doesn't really want to tell his wife Jackie (Ryan) that they're running low, not with two young daughters to care for as well. Plus he's coach of a terrible team and is just swimming in stress. Swimming in it. So much so that while jogging to work off the stress, he suffers a panic attack. Just when Mike thinks some of his problems have been solved, teenage Kyle (Alex Shaffer) walks into his life. Kyle, it turns out, his Leo's grandson, and they've never met. Kyle's been sent by his mom to visit Leo. At first, this complicates things  especially when Kyle seems awfully reluctant to go back home to Ohio  but then Mike's remaining big problem is solved. It turns out the kid is a gifted wrestler. Who'd have thought that? He looks scrawny, but in practices Kyle shows he has the mettle. And thus things are riding well for Mike. But this would be a truly dull (if inspirational) movie if things continued to ride well. One thing we learn early on is that Mike intentionally misled the judge in Leo's case, giving the impression that he would be actively taking care of Leo. But things really get going when Kyle's druggie mom (Melanie Lynskey) shows up to bring her boy back  and to take over as Leo's guardian. 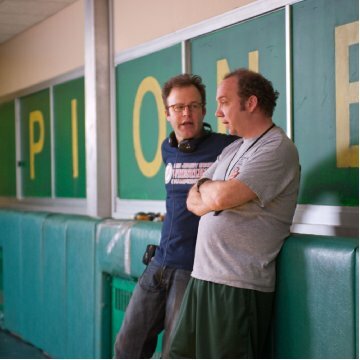 Too often, Giamatti has played real sad-sack characters, guys who just can't seem to catch a break, guys who suffer at the hands of fickle fate. Not so here. Mike isn't exactly a conniving mastermind, but he's not an idiot, either, and he deals with each situation with logic and reason, even as they spiral further out of his control. 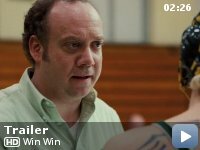 It's a typically masterful Giamatti performance, and for once he's not a total loser who's in over his head. He's even a half-decent coach who simply has a lackluster team to work with. Giamatti's not alone, though. I really got a kick out of Amy Ryan's performance as his somewhat-exasperated spouse Jackie, who's not terribly fond of suddenly having a teenage boy around at first. 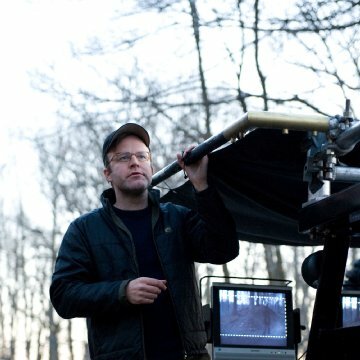 A few years back, Ryan turned in an Oscar-nominated performance as a native Bostonian in Gone Baby Gone. Ryan had a thick, believable Boston accent then. Here, she's playing a New Jersey native, but at no point does she go overboard with the Jersey Shore dialect. That's what good actresses can do  they can dial it back when they have to and show a little nuance. Win Win is not a stand-up-and-cheer movie, although the audience at the screening I attended applauded when it was over. It's not a crime drama, and it doesn't really have a lot of twists to its plot. 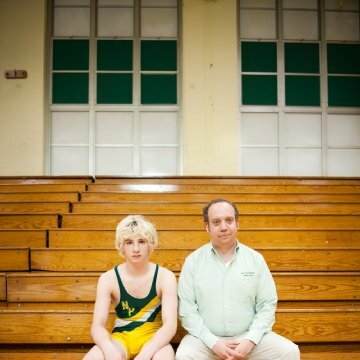 What makes it work are all of the truly sincere, dead-on performances: by Giamatti, Ryan, Shaffer, Lynskey, Bobby Cannavale, and even Jeffrey Tambor as one of Mike's wrestling assistant coaches. Not a sour note in the bunch, everyone at the top of his or her game. This might have fared well, critically, if it were released during awards season. It sort of reminded me of last year's Greenburg, starring Ben Stiller, only funnier and sweeter. Win Win is a charming, quiet movie that reminds us that, as the Grateful Dead once told us, once in a while you can get shown the light in the strangest of places if you look at it right.